Although the true feast--the Christ Mass--was held at Redeemer, we did a fair bit of feasting at home, too. In fact, it seems like cooking and eating have been the main occupation the last few days. We chose to ignore the well-meaning suggestions for lightening up our holiday food that Bethany found. Instead the day of Christmas Eve started with orange rolls. Before dinner, during the afternoon, we had cheeses, and olives, and smoked oysters, and dates, various crackers and a couple of kinds of snack mix. For dinner we had a gorgeous, delicious, perfectly medium-rare standing rib roast, twice baked potatoes, carmelized brussels sprouts, salad, and herb yeast rolls. We had an Argentinian Bonarda that I bought over a year ago and had been saving for a perfect piece of beef. It was lovely, especially since we had excellent company in my mom and my Wicked! Dessert was cookies. Today we had what has become our traditional Christmas day meal of chicken tetrazinni. It is a wonderful, rich recipe and perfect because I can make it ahead and just pop it into the oven after church. We had a salad, some roasted garlic bread and a french baguette. We opened an Oyster Bay Pinot Noir, but it was a big disappointment. It was thin, almost no legs, and its citrus notes were mostly reminiscent of slightly sour orange juice. So we finished up the ends of several other bottles. For a bit more food, this for the mind and soul, check out Pastor Petersen's Christmas Eve sermon. My friend Susan posted today about how uncertainty about what the government is doing and going to be doing makes making certain decisions difficult. This is so true, and one sure sign that our government is too big and too intrusive. Relatively pleased with the article that came from my interview last week with a reporter from the Fort Wayne News-Sentinel. She was slightly wrong on Patrick's reading age, but I think it was more a matter of me not being clear as we were talking. But over all she seemed--unlike other reporters I've dealt with--not to have the story already written in her head. She didn't take my words and torture them to mean something different, or quote me out of context. She seemed to comprehend what I was saying, and she reported it accurately. Was inside the new addition at Trinity English Lutheran yesterday. Wow. Aesthetically pleasing and maintained the integrity of the building. Very nice. Spent the whole day shopping Saturday and only managed to add to my list. There are a ton of bulletins to be printed between now and January 1. I'm planning my reading challenges for this year. I read a lot of books this year, but not as much quality as I would like. So, for 2010 I'm going to do a bit more brain-stretching. If you have suggestions, I'm talking about it here. From time to time I'll post about a food product that I like that has gone missing. This time it's Hershey's Raspberry Chocolate chips. These aren't anything that I ever would have bought--I don't even like Hershey's chocolate--except a neighbor made some cookies for me that included these chips, and I was hooked on the recipe. Since only one store locally stocked them, I bought several packages for convenience. I used the last package last year. So I started looking for them in preparation for my Christmas cookie making, only to discover that Hershey apparently no longer makes them, and hasn't for a couple of years. So, I think what I'm going to try to do is find a dark chocolate raspberry candy bar that I could "chip." Any suggestions? This will cook on low all day. When I get home around 3:00, I'll taste test and may add some more spices. I'll let you know. Shred the beef and smoosh the beans a little. This is good on flour or corn tortillas, with or without cheese, lettuce, tomato, onions, etc. I like avocado with it. You can always stretch the beef with more beans. The boys will add some sort of hot sauce to theirs. I'll probably make some rice to go with it. Yesterday I did a big chunk of the cooking for our family Thanksgiving dinner at my mom's house. Usually I am her assistant, but she was supposed to spend more time sitting this year. So, using her list and timetable, I ran the kitchen. Kind of. Because, of course, she was never farther than the kitchen table. And she was up and down like a jack-in-the-box. But I did get to make the stuffing, mashed potatoes, and cole slaw. I asked her to come out and make the gravy, because I make it so rarely that I didn't want to ruin it for 20 people. There is also no way that I could have gotten it all done without Bethany and Patrick. Patrick helped me core apples for my stewed apples the night before. He cleaned and arranged the veggies on the veggie tray and peeled 10 lbs of potatoes. Bethany made the fruit salad and helped me with the dressing. (I toss it with my hands, so she was pouring the hot butter & chicken broth on while I tossed it.) She also set and decorated the tables. Everything was so good. My niece Kate made pumpkin pie and my step-sister Susan made her awesome sugar cream pie. I had to have a sliver of each. Nothing exciting or exotic, just lots of good homemade food. And I am stuffed. I never eat that much on Thanksgiving, because I am so busy. And usually we go shopping on the Friday after--not Black Friday bargain shopping--leisurely shopping at the nice mall that has Nordstrom, and Crate & Barrel, and Pottery Barn, and Anthropologie, and cool local shops, and the Cheesecake Factory. But today we stayed at mom's and mostly relaxed. And we ate leftovers. I ate much more today than I did yesterday. So I am stuffed. And so is my fridge, because mom sent the leftovers home with me. Tomorrow I have an appointment with a turkey carcass. Today it hit me: It's almost Thanksgiving. That led to the exciting realization that it's almost Advent. (Really, doing the Thanksgiving and Advent I bulletins was a clue.) And that of course, made me realize that it's getting closer to Christmas. For a number of years, when we were living away from our families, Christmas lost its sparkle. It was stressful. It was a hassle. We had to pack up our kids and the presents, suffer hours in nearly stopped Chicago traffic, arrive at my mom's late at night. We would spend a couple of days racing from relative to relative, never getting to see enough of anyone and seemingly never able to please everyone. I'm not sure how many years we went without going to a good Christmas Eve service. We would return to Chicagoland tired and cranky. When we moved to Fort Wayne, I was determined to recapture Christmas, both for me and for our kids. The Christmases of my childhood and teen years sparkled in my memory, and I wanted to reclaim that joy. So I searched back through the memories and realized that through the years the family gatherings happened, gifts were given and received, and things changed as things do. But there was one anchor: church on Christmas Eve, mostly at my grandparents' church in Decatur. It is the standout element of my Christmas memories over the years. And this was what had gone missing. Not that we had left the true celebration of Christmas behind. We hadn't. We attended Advent services and did our Advent Calendar. We always tried to go to church somewhere on Christmas Eve or Christmas Day. The kids knew WHY we were celebrating. And yet, it was not the centerpiece. It was squeezed in. Not anymore. As much as I loved Christmas before, I love it even more now. We made the decision to build our Christmas plans around the services at church. Whatever our extended families have going on, we are going to be at Redeemer on Christmas Eve early so that the acolytes and choir members in the family can get ready for the service. Then we will have beautiful music, and candles, and poinsettias, and a fantastic sermon and the Holy Communion in our beautiful church surrounded by our church family. And, in spite of the fact that we are seldom asleep before 2:00 a.m., we are up for the Christmas service the next morning. As a bonus, we can continue the Christ-mass for the entire twelve days, with services each morning. And that is our Christmas. Everything else is extra. And it is back. I love Christmas again. Now that that's out of my system, I'll enjoy Thanksgiving and Advent, and the anticipation of the coming Feast. One of my favorite things about doing the bulletins is that I have the hymns for the upcoming Sunday in my head all week. So, for this the Last Sunday of the Church Year, this hymn has been keeping me company all week. "Wake, awake, for night is flying." "Where are the virgins, pure and wise? To meet the bridegroom, come, prepare!" And in her heart new joy is springing. Her star’s arising light has come! Lord Jesus, God’s own Son. We follow to the wedding hall." With harp and cymbals’ clearest tone. We gather round your radiant throne. Sing shouts of praise eternally! There are some nasty people in internet land. I decided that rather than downloading a pre-made template I would change my layout html and then try to find a cute background. In my search, I clicked on a google search result, and ended up with a trojan horse and a virus. I had a number of things going on on my computer at that time, so it took me a while to figure out what was happening. I cannot fathom what makes someone want to embed a virus in what appears to be an innocuous, even helpful site. I tend to be a very un-trusting internet used, so the fact that this happened to me makes me realize how easy it is for someone to get a virus. I'm redecorating. It is in process. I've saved my old template in case I can't make it work. We'll see. I think it's about time for a blog makeover. I've wanted to update my links and blogroll for a while, and I'm feeling motivated to try a new look. I'm nervous about going outside Blogger for a template, but I probably will because I want something different. Any suggestions? What have you done? Any mistakes I should avoid? Will a public option play fair? You really think a public option will mean fair competition? These are some of the characterizations I have read of people opposed to the health care bill that the congress passed last night. We'll call it PelosiCare, or PC for short, to differentiate between it in specific and health care reform (HCR) in general. I am sure that there are some people who are against PC who deserve these descriptors. I am also certain that there are some on the other side who do also. But, in spite of the mouth-foaming rhetoric coming from many on the left, being against PC does not equate to wanting people to "just die quickly." Far from stupidity, what informs many opponents of PC are an understanding of economics and a fidelity to principles that is frequently written off as partisanship. But is it "partisan" to question the constitutionality of a requirement that people buy a product? Is it stupid to wonder how a government that always adds layers of cost, fraud, and bureaucracy to everything they do can claim they will save us money? When did health insurance become a right? As to charges of selfishness and greed, I am sure that I am not alone in thinking there is something horrifyingly greedy in a mass of people who are continually demanding to be given more, more, MORE--money for their house, cash for their clunker, "free" health care--from the government, from Obama (yes, really!) I heard a caller to a local radio show last week say that he didn't like the PC bill because it was going to make him buy insurance. He wanted the FREE health care that he believed the Democrats had promised him. Who's the greedy one? I am against PC. I am not against HCR. I think that the alternative plan presented by the house Republicans had many common sense provisions that would have helped to solve current problems, some of which have been caused by government intervention in the system. In spite of the rhetoric from the other side, we have the highest quality health care in the world. If I believed that the system set up under PC would make our system better I would not be so opposed to it, but I believe it will hurt millions more people than it helps and will very likely finish wrecking our economy. It will take away freedom to chose the kind of plan you want--all plans must conform to an as yet undecided government template, so people like us who choose a combination of a higher deductible, lower cost plan and a pre-tax health savings account will no longer have that option. It will force all Americans to buy insurance under threat of fine or imprisonment. I could write pages on what is wrong with this plan philosophically, morally, economically, and practically. But others have written these pieces, and this isn't primarily about the bill. It is about the negative, nasty characterizations of those who oppose it by those who support it. I know many wonderful, generous people who think that PC is wrong. I would gladly compare our family's charitable giving head-to-head against any liberal I know. I would be willing to bet that we give a higher percentage of our income to charity than any of them. And we are not alone in that. Being willing to tax other people and give away their money isn't generosity; but I can think of a few other names for it. This is our first year with no Halloween costumes. I suppose with a house full of teens and adults that isn't so unusual, but our kids always dress up and we usually have friends over. This year we had the usual plans, and the pirates were set to reappear, but Andrew is sick. Having the youngest down kind of took the wind out of the crew's sails. I think next year we'll need to plan a costume party. I haven't dressed up for a long time. For this year I'll have to content myself with giving candy to the neighbor kids. I had a comment on my to-do list asking for an update. 1. Learn to make a souffle. 4. Make a dress that looks good enough to wear. 6. Go to a Broadway show. 8. Make my own tortillas. 9. Make noodles as good as Grandma's. 10. Get my scrapping stuff organized and out of my dining room. Almost done. Soon. 15. Have six month emergency fund. 16. Ten pounds. Just ten pounds. Halfway there. 17. Clean the master bedroom. 19. And paint the furniture. 20. And the master bath, while I'm at it. 21. And the kitchen cupboards. Started. A year ago. Different kitchen. Rip it out. 22. And then the dining room.Yep. 23. Reupholster the dining room chairs. 24. Make a perfect risotto. 25. Make money doing what I love. Last week I read The Food of a Younger Land by Mark Kurlansky. I love reading about food and Americana, so this book--a compilation of Depression-era writings about food from an abandoned WPA project--enticed me as soon as I saw it. The division by regions gave structure to the book, and made it even more informative. However, my favorite bit of knowledge gleaned from this book was personal. I have always felt a bit of an inferiority complex about my clam chowder. You see, it has bacon. We like it that way. I grew up with it that way. My mom made it that way, and she learned from my dad's mom. But what restaurant clam chowder has bacon? I always figured this was some Hoosierizing of the dish. But, as I learned, I was mistaken. One of the oft-debated, but very authentic ingredients in real New England Clam Chowder, is salt pork or bacon. Which is then removed and the onions sauteed in the grease. That's what I do. Some add it back in; some don't. I do. My grandma was a Ruhl. Her mother was a Harrod. Her grandmother was a Pipes. HER grandmother was a Harriman from New Jersey and HER mother was a Hathaway from Massachusetts. That's in New England. That's about the only part of my family tree that has roots in New England. But I like to think that that is where the clam chowder came from. I haven't posted much about politics for a while. This is partly because I haven't been in the mood, partly because it makes me cranky, and partly because I just tweet it, instead. But Victor David Hanson has such an excellent piece at NRO that I had to post it. He examines the five trends that converged to elect Obama, thhe assumptions that seem to underly the Obama administration's actions, and the truths that they need to understand. Go check it out. I've mentioned before that I don't spend all that much time thinking about homeschooling. For us it is a fact of life--14 years of life--and after that long we just do. Not a lot of thinking required. But my friend Susan posted something that got me thinking. Re-entry. Our homeschooling has always been a fairly solitary endeavor. We haven't been big joiners. The kids haven't taken a bunch of classes or been invovled in many activities. At first this was because there were no other homeschoolers nearby. Later, it was due to the fact that nearby homeschoolers were fundamentalists who tended to find us questionable. Over time we came to enjoy the freedom of our lifestyle so much that a group, co-op, or other organized activity would have just been an unwelcome interruption. The kids were each others' best friends. Most of our friends were remote. Life was pretty smooth. That has all changed over the past few years. The introduction of outside classes, the subtraction of siblings off to college and work, and many more social opportunities for all of us have changed the pattern of our days. This year is the worst. Most late afternoons/early evenings we are all making re-entry. And we are all cranky. My kids fight more now than they ever did when they were younger. They aren't as patient with each other. It doesn't help that we're all coming home tired and hungry to a house that is messier than it has ever been. Ever. What is hard is to know what the answer is. The classes the boys are taking are beneficial. They enjoy the abundant opportunities to see their friends. I am definitely NOT getting too much friend time. I hardly see mine since our schedule is so packed and my kids are older than most of theirs. I need to work. And until Patrick can afford car insurance I need to drive him to class. I know I can't have those lovely bygone days back when all I had to do was cook, clean, and hang out with my kids, but I wish I could figure out how to make the way things are now more pleasant. It almost feels like we have lost most of what we have always loved about homeschooling. The HOME part. I need to think about that. More encouragement for you homeschool moms of younger kids. Especially those of you who have challenges. Here is my late reader, writing on his blog, about having to dumb down his writing for his freshman comp class. It really was a resounding thump. As I tried to evade some heavy smoke rolling off of our campfire, I turned and ran. Straight into a 6X6 cross beam at the shelter house. I'm not sure exactly how I got onto the ground, although I know I didn't fall hard because the rest of me didn't hurt. My kids said I kind of staggered and half fell, half sat. I just remember being on the ground with my little brother holding onto my shoulders and cradling me from behind. Yeah, it hurt. And I was dizzy and nauseous. So I let them take me to the emergency room. And the people at the ER were very nice and put me in a wheelchair, then a bed, then a CT scan. After a couple of hours they sent me home with a diagnosis of mild concussion and some instructions that--thankfully--included rest. I'm glad they included rest because that's really all I've felt up to so far this week. I think that the next thing on my list is getting reacquainted with my chiropractor. The ER doctor said that the effect on my neck would be similar to a whiplash injury and I'm feeling it today. The morale of the story: Don't run with your eyes shut, even if they're full of smoke. I have received several requests over the years for a list of must-read books on homeschooling. Last week a friend suggested that this would make a great blog post. So here it is. There may be some newer books that are missing. Since we've been at this for fourteen years, some of these may not be the most current books. I'm sure there are other worthwhile books that I haven't seen, but each of these is a gem. You'll notice that many of these books tend toward learning theory and the unschooly. Well, that's me. I would argue that it would be good for anyone, homeschooler or not, to read the Gatto books. And any parent would be well-served by reading the Moores, John Holt, and Cindy Tobias. This is a book that I wish every parent and teacher of young children would read. I read this as the stressed out mother of a non-reading seven year old and it probably saved my sons academic life and my sanity. This book isn't perfect, but as a homeschooling mom it really helped me to free myself from some of the school baggage I was carrying, and to free my children in turn. I consider these the "why to" books of homeschooling. Dumbing Us Down helped to bolster my flagging courage early on by reminding me that what my kids were missing wasn't all that great. These books are especially helpful when you are having to deal with critical and skeptical family members or if you--like me--spend lots of time asking yourself if you are ruining your kids' lives. I didn't always agree with Holt, but overall found his writing about learning to make a lot of sense. The closest thing to a how-to book on this list. So many people want to know HOW to unschool. Mary Griffith gives lots of ideas and helps to paint some pictures of what unschooling looks like. Both of these books are easy, quick, straight forward looks at learning styles and how to work with your child's strengths. This is the story of one family's homeschooling journey. Here is the review I wrote when I read it. This is not an exhaustive list. I have enjoyed other homeschooling books over the years, but these are those that I believe are the most important and have contributed the most to our success and enjoyment of this journey. What are some of your favorites? A week ago today I got the bug. I had to go to the orchard--right then--and get apples. So all week the house has smelled like apple something-or-other. Tonight it's apple butter cooking in the Crock Pot. I've made a couple of small batches of applesauce, but today I cleaned a bunch of canning jars, so tomorrow will be the major applesauce operation. For me, apples mean it's really fall. Of course, the frost yesterday morning was another clue. I ended up having an unexpected day at home on Saturday. It is amazing how much can be accomplished when I can just work on my house and yard all day. The kids and I cleaned inside and did some end of summer garden clean up. The yard is so much better. Lots of weeds and overgrown branches found their way to the curb. We also cleaned up the blighted tomato plants. I still have lots of projects to get done, but it feels good to have accomplished this much. I love it when she unearths something she wrote a while back. This time it's a series of obituaries. Enjoy. This piece highlights what I think is one of the most maddening and potentially dangerous things that the Obama administration and left-wing media are doing. Much of what goes on in Washington right now stuns and saddens me, but I think that the attempt to paint anyone who disagrees with Obama--or who is against this particular plan for health care reform--as a racist is the worst. This suggestion that ideas differing from Obama's necessarily spring from the most odious of sources has the potential to create new wounds and create new divisions where none previously existed. Sure, racists don’t like Obama. (In less shocking news, bears continue to use our national forests as toilets.) But that doesn’t mean everyone who dislikes Obama is therefore a racist. This would seem so obvious as to not require stating. Unfortunately, it seems that it does. In my title I used the word evil. I do believe that this is evil. Those who wish to marginalize conservatives and who have shown a willingness to shut down expression that does not match their agenda are using one of the most heinous accusations--requiring no proof on their part, because we long ago learned that the accusation of racism is tantamount to conviction in the media--to accomplish their goals. Racism is a tremendous evil and ought not be tolerated, but I fear that injudicious playing of the race card with ever-increasing frequency may only empower it and add racists--on both sides--to the fold. I've been wanting to blog, but I've had a couple of problems. The first is that I'll think of good topics, but then by the time I get a chance to post, the thought has fled. The second is just busy-ness. The third, and probably most powerful problem is that I have been nearly obsessed with what's going on politically, but just don't feel like talking about it. I even hate thinking about it. If I were to post about what has been occupying my mind lately it would be almost all politics, with a few posts about feeling broke thrown in. (Nothing like having kids in college to make money disappear! That wouldn't be much fun to read. I've been doing some reading in economics, which has just added to my near-despair about the direction in which our country is headed. I have to break up my reading with escapist fiction like a Georgette Heyer, some sort of chick lit, or a good mystery. I'm feeling a bit nostalgic right now. As the new school year starts all around us, and I prepare to send a second child to college, I'm missing the days when I had four kids at home. There's nothing much more fun than being the unschooling mom of a bunch of curious kids. I miss the "field trips" to the state park or forest preserve. (I put field trips in quotation marks because it wasn't anything organized. In the fall, especially, our life was one big field trip.) Taking two teens to walk at the park isn't nearly as entertaining as taking a crew of 4, 6, 9, & 13. Don't get me wrong. There are wonderful things about this stage, too. I love to spend time with my grown and nearly-grown children. I'm sure that the excitement when Andrew has his braces removed next week will be something to remember. We have much deeper discussions than we could before, and each of them can cook dinner in a pinch. But with the approach of fall, I hear echoes of those little voices, and would love--just for a moment--to go back and do it again. I realized this morning that I missed making my usual birthday post for one of my children. I can only say--by way of excuse--that I was kind of immersed in preparations for Wisdom and Eloquence. It's hard to believe that he is 19. Sometimes it feels like he's been an adult forever, other times it seems like just last week that he was standing in the middle of the soccer field, flapping his arms in excitement over the combine in the adjacent corn field. Week after next a new adventure starts as he begins his classes at IPFW. Wow. This is always the time of year that I feel the most out of step with the world around me. Back to school sale fliers fill the newspaper and mailbox. I hear my neighbors talking and read the celebratory Facebook statuses. Parents express relief and joy that their offspring are once again back in school. For 13 years, back to school has been largely meaningless at our house. We'd watch the back-to-school season, hear the neighbor kids mourning the return to school, and then enjoy sleeping in on the first day of school. Because our lives are pretty much the same year-round, there is no new school year at our house. It has changed things a bit to have college students. When someone starts college we lose part of our pack. It takes a while to get the dynamics worked out. For four years it was Bethany going off to classes and now it will be Patrick. In two years Jonathan will leave me here alone with Andrew, and then two or three years after that it'll be his turn to go. But that isn't the same as sending your kids off to school for the day. I have to say, I share the joy and relief of the parents of school children at the return of their kids to school. I can once again enjoy a relatively peaceful trip to Target without hearing their kids whining and begging. We'll take a trip to the zoo next week and it will be relatively empty. I can go to the mall without being run over by kids wearing those ridiculous shoes with skate wheels in the bottom. All of my errands will get easier. But my kids will be enjoying it with me. My friend Sandy is a deaconess intern working on a project developing a Lutheran hymnal for Kenya. She has a new blog devoted to the project. My sons are great about helping me in the kitchen. Patrick and Jonathan are great prep cooks and they are all three fabulous dishwashers. The problem is the aprons. They have learned from me that it makes a lot of sense to put on an apron to protect their clothes while they work in the kitchen. But with one exception--my indestructible denim apron--all of our aprons are pretty. Really, really pretty. Ruffles on teen-aged guys just aren't a good look. And although I like the pretty aprons in theory, I'm not giving up my sturdy denim apron to anybody. Looks like it's time for the cleanup crew! "I know that book is in the basement somewhere"
My kids have heard me say it more than a few times. I said it about Candide. I said it about Native Son. I said it about Death be Not Proud. I said it about a few books that I've purchased in the last couple of years, even though I was sure they were in the basement somewhere. Today I found them. In a large, tall Rubbermaid container. Under Bethany's drawings, costume jewelry, Valentine napkins, and packing paper. On top of miscellaneous legos, pieces of toys, and plastic Easter eggs. This bin had been packed by our movers on April 27, 2002 in our basement in Spring Grove. It had been in storage in a warehouse for several weeks. Then it arrived at our house in late May. It was opened, judged--based on the contents on top--to be something I could look through later and put aside. Somehow it got shoved behind the even larger box of dress-up clothes and the box of castle and pirate toys and under the desk that was left in the basement by the previous owners. Earlier basement cleanings assumed that since it was a Rubbermaid bin, the contents were supposed to be there. Until today. Patrick and I are leaving no box unexamined in the quest for things we can sell, throw away, or otherwise dispose of. He opened the box and the first thing I saw was a drawing of Bethany's, followed by a Xerox of three-year-old Andrew's hand. We pulled the box out, swept off some webbies, and began the excavation. I've been having all kinds of thoughts about education bounce around in my head after our Wisdom and Eloquence Retreat last week. The main speaker is a professor of Rhetoric, and a big proponent of Classical Education as the best way to educate children. I have never aspired to be a classical educator. I own a copy of The Well-Trained Mind, but it sits, unmolested, on a shelf in my family room, from whence it shall--someday--join the ranks of those books destined for the used book store. I may read it first, but I'm waiting until the kids are all finished homeschooling. All that said, as one of my more unschooly friends and I listened to Dr. Classical Ed last week, we were both struck by how much the process, the tools, the very structure of classical education mirrors the de facto way our unschooled children have learned. You would think that classical educators would like this affirmation that, yes, this is naturally the way children's minds work at these stages. But they don't. Not from us. Like classical ed, we reject the boxing into subjects that progressive education insists upon. We agree that knowledge is interconnected. As is suggested in TWTM, we have always used history as a framework for "hanging" our knowledge. We have not taken the organized, cranked down approach suggested by classical ed, but we've gotten to the same desired place, with our children ready to join in the Great Conversation. Am I saying we are classical educators? Certainly not! I gladly wear my badge of mostly unschooly-ish-ness. It keeps me sane and my children happy. And I'm also not arguing for the superiority of any one way of doing things. My philosophy is that each family needs to determine what works for them. But if your end desire is kids who know things, can think critically, and can speak and write clearly about what they know, from a basis of the great tradition of the western world, well, there's more than one way to get there. Some thoughts on Classical Education and Lutheranism from my good friend Elephant's Child. I have lots of thoughts percolating on all kinds of education-related topics. I'll see if any of them make it to the surface. Last night we had a square dance and line dancing at our Wisdom & Eloquence Retreat. When it became obvious that the really little kids weren't getting it, someone offered to take them to go do crafts. So the first unexpected thing heard at the square dance? "Little kids can join Pastor Petersen in the Youth Room for crafts." Second unexpected thing? The square dance caller calling him Pastor Dave. You certainly don't hear that every day. I don't usually get into all of the giveaways, etc. that are out there, but these aprons are too cute. I love aprons! Summer time and the livin' is...frantic? What happened to the slow, wonderful summers we enjoyed when the kids were younger? I remember long lazy days with nothing to do except spend the afternoon at the pool or watching old movies. This summer, so far, is passing in a blur. Some of the busyness was expected. I've started working part-time. Patrick had registration and orientation. We had the graduation party. But much of it has been unexpected, and it has all worked together to make June go amazingly fast. I'm obviously not blogging every day, but there will be another post later today. My friend Cheryl's blog. June 10 and June 12 posts. Okay, I missed a couple of days. I had an excuse: I was preparing for, executing, cleaning up after, and recovering from a big party. I could have popped on and posted, "Too busy to blog," but didn't see the point. As I was catching up on Facebook statuses today I saw several people with status updates from yesterday mentioning that they didn't get to say the Athanasian Creed yesterday. This is just another of those odd things about us confessional Lutherans. We get all excited about reciting a REALLY long creed once a year on Trinity Sunday. Now to start the rumors going: We didn't say the Athanasian Creed yesterday at Redeemer. Nope. We sang it. Set to one of the tunes used for the Te Deum, we sang the Athanasian Creed. I don't remember if this is the second time, or if we did it before, but I love doing the creed that way. I could post about the president's speech in Cairo, but plenty of other folks have done that today. And I have no desire right now to think deeply enough about anything going on in the political arena or on the world stage to write about it. It's just too depressing. I could write about my day that just disappeared due to unexpected complications. Or maybe I could write about my leaking dishwasher, but I'll save the whining for Facebook. If I had some pictures I could post about my garden. This is the first year that I haven't taken pictures before I started to harvest, but I planted some things much earlier this year, and we are enjoying the garden already. Last Saturday night we went with a big group of our friends and family to Parkview Field to see the Tin Caps play. Jonathan sang the national anthem, which got us all there, but we will definitely go back. It was a blast! The stadium is beautiful and designed so that when you go to get concessions, or walk around, you can still see what's going on. You don't go into some dark concourse to get a snack. There was lots of other entertainment during the game, keeping the little kids happy. And the baseball itself was really enjoyable. I love being downtown and I love being able to see downtown from the stadium. After the game two of the boys were hungry--having so much fun that they didn't ask for food at the game--so we went to King Gyros. I've been to lots of ball games at pretty much every level, but this is the first time in a long time I've been ready to go back soon. It's a great value for good family entertainment. (Cheaper than a movie!) I'm even looking at getting partial season tickets next year. Really, I don't care if it's a lady. I just want someone to clean my house. Someone that isn't me. It's not that cleaning is that awful. I used to get paid to clean other people's houses, and I really didn't mind. I'm not sure why I hate cleaning my own house so much. I haven't been in the mood to write about anything. At all. That's really unusual for me and I need to write. So following the example of one of my friends, I am going to blog every day in June, thus the badge at the top of my sidebar. This is a pretty lazy start to the month, but it's all I've got for tonight. Watching your kids grow up is one of the scariest, best, hardest, most wonderful things a parent gets to do. Each stage from sitting up and taking first steps, through driving lessons and teen-age angst, is a new experience, especially with your first child. This is an eventful time around our house. Last Wednesday night the proud papa and I watched as our oldest was named outstanding senior by the IPFW history department and honored for being at the very tippy-top of this spring's graduating class. Two weeks from tomorrow she will graduate. Today we got additional happy news. She has been hired by a local law firm to be a paralegal. A real, full-time, grow up job with benefits! She is excited about the job, which should be interesting and challenging. We have another graduate this spring. Patrick is finishing high school and will be attending IPFW in the fall. He's not certain about a major yet, but is looking forward to getting started. I have to admit that the homeschool mom part of me is feeling a certain amount of vindication. Oh yes, I realize that I still have two more to graduate, and Patrick isn't DONE with college yet, but I'm seeing that they have the ability to function as competent adults. I'm beginning to feel more confident that I haven't ruined their lives. Tomorrow we will celebrate another big birthday. But that's another post. Wow. I haven't blogged for five days. I'm not sure how that happened, except that I have been busy, and, for at least the past few days the weather has been fantastic! I got more goodies planted today. We now have two kinds of lettuce, spinach, mesclun, green onions, carrots, beets, turnips, kohlrabi, peas, and cilantro planted. I also planted some viola seeds and poppy seeds where our tree used to be. My tan is coming back. Sounds like we'll get rain tomorrow. For dinner tonight we had caramelized brussels sprouts. They were sooo good. Even if you don't like brussels sprouts, I think it's very likely that you would like these. I can't even remember who posted about them. RPW? Beth? And maybe it was on Facebook, which makes it amost impossible to find again. I've decided that I need to figure out how to grow them, because it was one of the yummiest veggies I've ever had. We also roasted a Seven Sons turkey and marveled again at how much better these turkeys are than what we buy in the store. UPDATE: Thanks to a comment from Beth, I now have the link to the recipe on RPW's blog. Thanks, Beth! Tonight's dinner was so incredible. I was also so easy. I'm really trying to increase the amount of veggies that we eat. We do great in the summer, but sometimes during the colder months I have trouble. We always eat some, but probably not as many as we could. I have roasted veggies at times in the past, but have been doing it much more frequently. Tonight I made two 11x14 pans of roasted veggies. I think we could have eaten twice as many! I just used what was in the refrigerator: sweet potatoes, onions, garlic, cabbage, carrots, and squash. It was awesome. Tomorrow night I'm going to try caramelizing some brussels sprouts. Speaking of food. Pioneer Woman has a quiche recipe that looks really good. Can't wait to try it. Been having a bit of trouble feeling like writing anything. I think it's partly too much exposure to the nastiness that has been bubbling up from certain parts of the blogosphere. But if you want to read an excellent blog post, my friend RPW has written a doozy. Or you can go to my book blog and read my lazy meme post. This is a day to get things done at home. I'm going to work on getting the downstairs cleaned. I'm going to plant the first seeds: spinach, lettuce, peas, beets, green onions, and turnips. Bethany needs a resume and cover letter, so I am helping her with those. Later this afternoon I'm going to the store to get the fixings for Mexican food and margaritas for tonight when a couple of friends and their kids are coming over for dinner and games. I'm hoping that next week we have the sun and the warmth to allow me to get the windows and screens clean. That would really brighten things up in here. 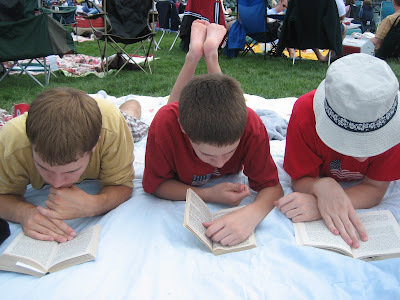 Fellow homeschooler Susan, has a post about her experience with an Illinois Tea Party. I hadn't been paying much attention to the left's characterization of the Tea Party movement until today. When I figured out that I wasn't going to be able to get to Indianapolis for today's event, I decided that I would follow the parties on the news and Twitter. The left is in a tizzy. The malice and nastiness is amazing. They are either purposely misrepresenting the Tea Parties or have managed to maintain their ignorance about what they are about. They have made up conspiracy stories about the origin, even though many of us who are active online at TCOT and Smart Girl Politics and on Twitter watched the idea grow and spread organically. They are not anti-Obama. There may be some people who are stridently anti-Obama in attendance, but that isn't the purpose. I would venture a guess that you would find as much disgust with Republican politicians and congressional Democrats among the protesters as with Obama. When I go to our local tea party on Saturday, one of our signs will be questioning our Republican congressman and his vote for the bailout. They aren't simplistically anti-tax. The vast majority of the people attending the Tea Parties have been paying taxes for years and expect to need to pay taxes to fund the government. There is probably a wide variation among those in attendance over what they believe is legitimate government spending. They aren't about, as one pundit said, the taxes on the wealthy going up 3%. What they are about is spending. They are about bailouts, whether for Wall Street, GM, or the neighbor down the street who refinanced, bought that big screen, and now can't afford his mortgage and owes more than his house is worth. They are about unbridled spending under the guise of rescuing the economy, and passing an ever-growing debt on to our children. They are about politicians passing spending bills when they don't know what's in them. They are about concerns that our constitution is being shunted aside by a federal government that insists that states and companies take funds they don't want and that seems almost daily to stretch the limits of its power. They are about the printing of more money, more foreign ownership of our debt, and the devaluation of our currency and inflation that many economists believe is coming. That's what's on my mind tonight. I finished my taxes, finally. It's cold and rainy, and I'm really ready for the sunshine. Tomorrow the boys and I are picking up my mom and heading to Indy for the Tea Party. Still having fun with Polyvore. Need to do some serious housecleaning. The kids and I went to church this morning. I really appreciate the Easter Monday service. It helps with the let down after the richness of Holy Week and Easter. Back now to real life. I need to finish my taxes, clean my house, and do some major organizing. I hope this is the beginning of a tradition at Redeemer. 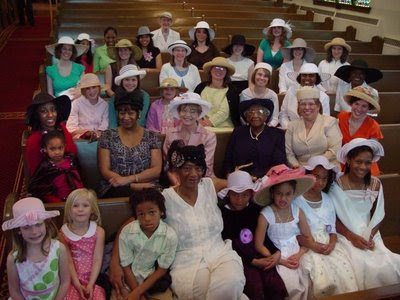 A pretty good chunk of the ladies in the congregation wore hats today. I think there are a few more who will when we do it again. Have I mentioned recently how much I love these ladies, and the rest of my church family? The service was of course, lovely. The music was glorious! The sermon was excellent. All in all a wonderful Easter. He Iives to bring me safely there. Author: Samuel Medley, 1775, ab. Hold him as a mortal. shone as light amid the gloom. wrought his work, and met his death. And flee before Thy glance. That once was bright as morn! The splendor that was there. Thy strength, in this sad strife. Which brought this woe on thee. O Savior, do not chide me! Thee in mine arms I'll clasp. I'd breathe my soul to Thee. By virtue of Thine own! When my last hour draws nigh. My heart by faith enfold Thee. Who dieth thus dies well! Based on the Latin poem "Salve caput cruentatum"
By Bernard of Clairvaux, 1153, asc. As of this morning Uncle Sam owes me 27 hours of my life that I will never get to use for something worthwhile. And my taxes still aren't finished. That's just this year. These hours don't even count the time I spent last month going through old paperwork determining what could go and what had to stay. This doesn't count the time I have to spend every day documenting my mileage. Or moving around mounds of paper that might possibly have some tax significance next year. Our tax system stinks. (If you know me well, you know the word that I wanted to use there.) We need the Fair Tax, a flat tax, or some other simple tax plan. I also wish that we had a system that made people pay their taxes instead of having them withheld. That might wake some people up to how much the government is really taking out of our pockets. ...that I really didn't need to know about. My friend Polly mentioned Polyvore on Facebook last night. Oh. Oh my. Oh me oh my. I have lost some time there today. It is like scrapbooking with clothes. Mixing and matching, playing with colors and styles; it's like having the run of some awesome closet. If you loved dressing Barbies or paper dolls, it could be dangerous. Yes, I did find something to wear for Easter. I was going to head back to Von Maur and try on a scary-expensive dress and jacket, but decided first to try Burlington Coat Factory. I had never been in there, but a friend suggested it, so I went. First, I was surprised at how nice it was. I was expecting the chaotic warehouse shopping experience, which I hate, but it was very well-organized and pleasant inside. The first dress I saw was $29.99. It was one of the two dresses that I had tried on at Von Maur. Same fabric. Same brand. The price at Von Maur was $69. Whoa! I wasn't seeing anything, until I walked all the way past the clearance stuff to the edge of the department. I saw a couple of racks of ladies suits and two-piece dresses. Jackpot! I found a warm cream two piece dress that looks decent and cost a fifth of what I was willing to spend. I need to get some shoes, but that shouldn't be hard. 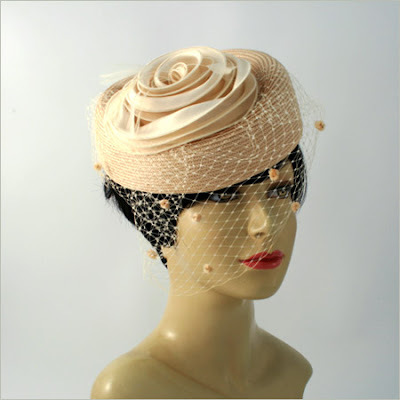 It also should look good with the hat that I fell in love with. Yesterday I tried again. This time I went to Jefferson Pointe. I did see several things at Von Maur that were very pretty, unfortunately they were constructed in such a way that they were more revealing than my undergarments. Not good. I did find a dress for my favorite life-size Barbie, who really doesn't need a new dress, but I couldn't resist. I enjoyed walking around JP in the gorgeous sunshine. I visited a few other stores, including my beloved Chico's, even though I knew that they wouldn't have what I was looking for this time. I did find a really pretty shirt, though. I decided that I would visit Stein Mart on my way home. I got to my car and began searching for my keys. And searching. And searching. Looked in the car window. Couldn't see the keys anywhere. Did I stick them in my pocket instead of my purse when I got out of the car? Did I drop them when I was putting them in my purse? Did I drop them when I was paying at one of the stores? I retraced my steps, asked at each of the stores. No luck. Called Bethany to come get me, but then I realized that that would do no good, because I have the only key to that car. So I called a locksmith who could make me a new key after we got my door open if the key wasn't in there. It took about 45 minutes for him to get there, but I had Bethany most of the time, so it went pretty quickly. He popped open the door and I got in and started looking. My keys were under my book bag on the passenger seat. I still have NO idea how they got there. --Do not talk on the phone to your mother and your almost-five-year-old niece while getting out of the car. --No matter how many paranoid emails you get about not locking the car with the key fob because of people waiting in parking lots to steal the signal and break into your car, use the key fob. I am--obviously--in far greater danger of locking the keys in the car. --When they doctor has just told you to avoid citrus fruits, don't drink lemonade, no matter how thirsty you think you are and how good it looks. Bethany and I attempted to shop today between other commitments. I was looking for something to wear for Easter, a dress or a pretty skirt. Unfortunately, we had no luck. I didn't even find anything that I was interested enough in to look at the price tag! The prints were ugly, the colors were garish and the fabrics were cheap. Why, oh why, is it so hard to find pretty clothes? But unfortunately, in this climate, it seems sadly necessary. Angie Harmon says, "I'm not a racist because I disagree with Obama." The Racist Card is becoming the new tool for attempting to stifle dissent. Racism is evil, and so is accusing people of it because they don't agree with you. Being called a racist is difficult to defend against--because you're stuck trying to prove a negative-- but it can't be accepted in silence. I had a great time at the scrapbooking retreat. I completed over 50 pages and had a nice visit with my mom and my friend Lori. I also enjoyed getting to know another friends from church better. This is going to be a whirlwind week. Things just keep piling on to my schedule. Been thinking a lot lately about words and language and the internet. I've always been a word buff and love learning new words. I like to use precisely the right word when possible. (Sometimes, as I get older, they seem to go missing.) Nuances, subtle shades of meaning are important. It has always irritated me when people say,"Communicating on the internet is hard," or "It's too easy for things to be taken the wrong way." I've had people misbehave on my email lists for years and then blame those who took offense for not understanding them properly. But think about it: Is communicating in writing on the internet any different than communicating in writing on paper? I don't think so. What is different is the amount of thought that is put into it. People will say that spelling and grammar don't matter in email, but those conventions exist for a reason. They make communication clearer and easier. People will write things in an email that they would never commit to paper. They will send an email un-proofread because it's just email. Sometimes, too, I think that people do not communicate well on the internet because they don't read well. They skim. And all too often, between the sloppiness of the writers and the lack of skill of the readers, the meaning gets muddled. Then, too, I have seen people write things on the internet or in email and then express surprise when they draw an unfavorable reaction. They almost always say the same thing, that the offense is in the mind of the reader. But in reality, the offense is in their words. People seem, for whatever reason, to more readily deny the clear meaning of their words online than in print. Maybe it is because much of online writing is done in haste. I, personally, have a read-three-times-rule for any writing that is prompted by emotion. After I write it I make myself go back at least three times and read it, with at least thirty minutes of thinking about something else in between. This has saved me from many emails and blog posts that were better not shared! For this communication thing to work, online or off, people need to understand what words mean, use them properly and carefully, and then own them. If we want to communicate more effectively online, reading effectively written items--good books, old letters, even well-written blogs--can be a tremendous help. And we should always, always give things a second read--I usually do this aloud--just to make sure that we are clear in what we are saying. Why is it taking me so long to get my photos organized for the scrapbooking retreat? Why can't I get Def Leppard on my iPod? Why the big stink about pink? What should I make for dinner tomorrow night? Are the rest of us going to catch Patchy's yucky cough/fever/sore throat? Will I sleep all night tonight? Is my house ever going to be clean? If you aren't hearing about Obama's teleprompter, you probably aren't paying attention. Or maybe you only watch MSNBC and read Kos. But the discussion is everywhere, serious and otherwise, about this president's dependence on his teleprompter. We saw in the campaign that he had a little trouble speaking off the cuff. Last night he appeared on Jay Leno's show--which is another topic--and showed once again that he REALLY needs his 'prompter. So, for your reading pleasure, Obama's teleprompter. Aka, TOTUS. And his book. I'm going to warn you right off the bat that if you are a big fan, or defender, of institutional schooling you might want to skip this post. Or, better yet, you need to read it, be offended, and then read the book. I've been reading Weapons of Mass Instruction by former New York State Teacher of the Year John Taylor Gatto. His book Dumbing Us Down helped shore up my courage when we started homeschooling, by aiding me in articulating some of the things that bothered me about the way that we school children. This book is reminding me again, and giving me reasons for much of what I see going on around me. Gatto's books take a good hard look at the dichotomy between what we suppose that schools are for--to produce an educated citizenry--and what they were really designed to do, and do well. That is, to provide a trained, more homogenized workforce that does not question that the experts know best and that recognizes that some animals are more equal than others. Statistics like this explain why, when I'm discussing the news or world events with people, or am involved in an online discussion, I ask myself again and again, "Can't these people READ?" Unfortunately, that answer is likely to be no, since reading proficiency is even lower among those who are not college grads. For years we have seen study after study that show that our schools don't do what we think they should. The antidote suggested is always more money and more time. What we generally don't recognize is that schools are doing exactly what they were designed to do. At some deeper level, I think many people know this. It is the reason why the main question homeschoolers get is, "What about socialization?" People worry that our children won't know how to wait in lines and get up to an alarm. Homeschoolers are criticized when their children don't fit in seamleesly with a group of others their age. Pepople don't worry that our children won't be able to read, write, and think. They worry that they'll make other people uncomfortable by being different. Consider this, "We want one class to have a liberal education. We want another class, a very much larger class of necessity, to forgo the privilege of a liberal education and fit themselves to perform specific difficult manual tasks." This is Woodrow Wilson, speaking to businessmen about the purpose of mandatory public education. Quotes like this and ideas like this are not the exception in the shaping of our schools. They are the norm. For an even more in-depth look, Gatto's Underground History of American Education is available online. Reading Gatto's books makes me realize what a subversive activity homeschooling is. It helps me to understand why, since we began this adventure 13 years ago, my outlook on so many things has changed. I question more. And I have taught my kids to do the same. There will be more posts stemming from this book in coming days. It bears many markings and dog-earred pages, each of them a potential post. Read the book. Even if you're sure you disagree. Once again I am trying to get a modicum of control over my life. Yes, again. I spent some hours Saturday--as I sat on the couch with my bum ankle and newly-twisted knee propped up and iced--berating myself for my lack of accomplishment. I haven't been to the Y in months. My house is pretty much of a wreck. I haven't baked since Christmas, aside from one delightful triple batch of biscuits. I am making almost no contribution to the family finances, even though a modicum of effort would add a significant amount to my income. I really want to sell my house, but there is a huge amount that needs to be done in order to accomplish that. As I stewed, I remembered a suggestion for mothers who get to the end of the day and feel like the haven't accomplished anything. Make a list of what you was accomplish and then cross items off. So I went back a week to last Saturday and wrote down everything that I had done. Suddenly, I didn't look like such a slacker. There was work done on the church nursery and books. There was an out-of-town trip and shopping. There were meetings. There was laundry and cleaning. There was cooking for about 50 people outside our family across three different occasions. Then there was a bum-leg day on Friday, when I at least got photos uploaded and ordered from Snapfish. I felt a bit better. Maybe I'm not a slacker. But I still have a problem. I have to find a way to fit in the things that I want and need to do.